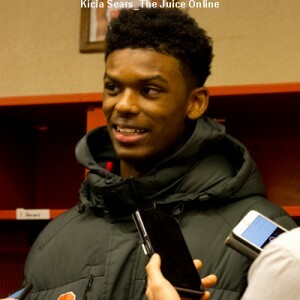 HomeBasketballHow does Syracuse basketball look through six games compared to last year? Following Monday night’s tight victory over Maryland to move to 6-0, it is pretty fair to think that this year’s Syracuse basketball team is a pleasant surprise. The team entered the season with lower-than-usual expectations due to a collective lack of experience and concerns about who would provide offense, but has shown to be an aggressive, scrappy team in pretty sharp contrast to last year’s squad. Last year’s team went as far as its offense could carry it, which would turn out to be not particularly far, as its defense was often leaky and sometimes worse. This young bunch has been pretty strong on defense and aggressive on the boards, mixing in some offense along the way. The 2016-2017 group had a tougher first six games, primarily due to two major conference opponents appearing in South Carolina and Wisconsin, both of whom ended the season rated in Jeff Sagarin’s top 25. This time around, the Orange finally faced a major conference opponent on Monday and had to scratch and claw to pull out a tight win. While a lot has been made of the Syracuse defense this season, and for good reason, there is one cause for concern on paper. This year, SU’s defense is allowing opponents to shoot 35.7 percent from the field, which is actually worse than last year’s 34.7 percent mark at this stage of the campaign. However, last season’s defense fattened up on lesser competition and got into trouble against higher quality opponents. South Carolina and Wisconsin, who both finished outside the top 50 in offensive efficiency last season, both shot over 45 percent against the Orange. This year, the small samples look pretty familiar. The current Orange defense allowed the Terps to shoot 45.1 percent from the field and held the lesser opponents to a much lower shooting percentage, aside from Texas Southern, who shot just under 45 percent. Syracuse is allowing their foes to make 34 percent of their three-point shots thus far, including 47.9 percent in their last two games. Last season’s group allowed their opponents to make only 24.2 percent of their triples in the first six games. That comparison leads to concern, as last year’s group got considerably worse against later foes, including allowing double-digit threes on 11 occasions. But, there is some consolation to be gleaned from that. Last year’s group was weak on defense inside, allowing 43.1 percent shooting on two-point shots in the first six games and 58.2 percent inside the arc on the season. 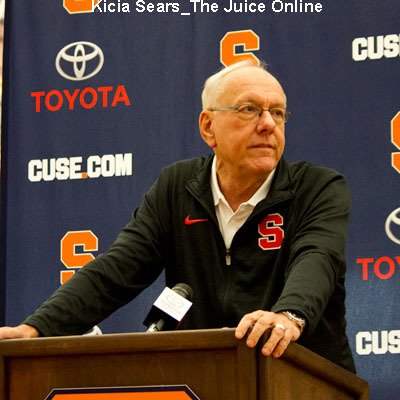 This year, SU has allowed their opponents to make only 37.1 percent of their two-point shots. Maryland was 12-of-28 inside the arc, which is only 42.9 percent success rate. Both Wisconsin and South Carolina made half their two-point field goals against Syracuse last season. Part of that difference in two-point field goal defense is the increased block rate this season. The Orange have collectively blocked 44 of 325 field goal attempts this season (13.5 percent). Last season, Syracuse’s first six games featured 37 blocks in 363 attempts (10.2 percent). While that does not seem like a great difference in rate, the Orange had five blocked shots on 99 field goal attempts by South Carolina and Wisconsin last season. Monday night, the Orange rejected five of Maryland’s 63 shots. 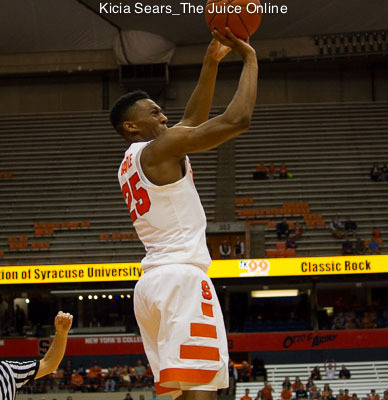 The long, active arms in the paint are a key part of the SU defense. Those long, active arms have also pulled down more than their fair share of rebounds, too. While on offense, SU has gathered 99 of a potential 230 rebounds, meaning the Orange have grabbed just over 43 percent of their own misses. Last year, through a half dozen contests, Syracuse had rebounded 36.9 percent of their misses. The Orange are allowing opponents to snare 25.3 percent of their own misses. Last season, it was 34.3 percent at this point of the schedule. Even in the Maryland game, SU owned a 39-33 overall rebounding advantage and grabbed 19 of their 39 misses. No matter how you slice it, this year’s Syracuse team is a lot stronger on the boards. SU’s defense is also getting more steals than last year, too. Through six games SU has 56 steals, which is a dozen more than they had last year at this point of the schedule. They also got a dozen steals off Maryland Monday night when they totaled 15 against South Carolina and Wisconsin last campaign. So, while the sample sizes have been small, they seem to suggest a concerted effort by Syracuse to clean up the defense against the easy shots inside and ride the uncertainty of allowing (and forcing) three-point shots from their opponents. Hopefully, the team will be able to clean up the perimeter defense… or just plain get lucky a little along the way.